Jingle Jamboree music classes incorporate the Kodály philosophy of music which originated with the Hungarian composer and educator, Zoltan Kodály (1882-1967). We believe that everyone is born with musical aptitude which should be developed as early as possible. The aim is to instill a love of music in each child. Singing is the foundation of children's musical development. The singing voice is the musical instrument of children that accompanies them wherever they go. Singing in-tune is a skill that all children can learn. The Kodály approach is a dynamic, exciting way of teaching and learning based on the developmental readiness of the child. The process involves a sequential layering of skills and concepts designed to build success for every child. Music education also develops the child's intellectual and social faculties. When a child plays music games based on the Kodály method she learns to express her feelings with confidence using mime and gesture. 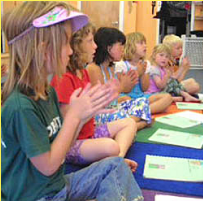 Learning the words, melody, and movements of a song help develop the child's memory. 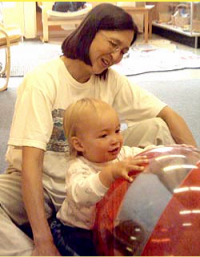 Understanding beat and rhythm develops through the use of movement activities. The development of singing in-tune comes by hearing the song at seven different times sung within the child's range, joining in the singing, and by isolating the intervals in songs. Furthermore, the duality of learning music and developing intellectually promotes the simultaneous use of the right and left sides of the child's brain. 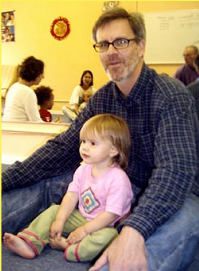 As the children grow, Jingle Jamboree music classes change to meet the developmental levels of the children. The classes incorporate the use of puppets, visual aids, interactive materials and song games. 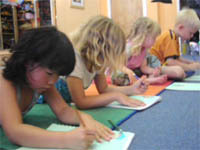 The focus of each class will be to develop the singing voice and each age-appropriate music concept. What happens when my child takes music classes before 6 years of age?